CORPUS CHRISTI, Texas - The Corpus Christi IceRays return to the ice this week with two big home games against the Shreveport Mudbugs at the American Bank Center, including a 10:00 AM school day game Thursday, Feb. 28 and Heart Night Friday, March 1 at 7:05 PM, benefiting the American Heart Association. 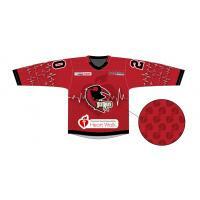 The IceRays will wear special red, heart-themed jerseys for Friday's game, which will be available for fans to bid on in a post-game jersey auction. Proceeds from the jersey auction, as well as a silent auction in the American Bank Center Arena concourse, will benefit the American Heart Association. The game is presented by AutoNation and Cable ONE. Over 5,600 students are expected in attendance for the game Thursday morning, presented by MD Anderson and Gloria Hicks. Anti-smoking "kick the butts" messages will be presented throughout the game, as well as a special intermission program as MD Anderson presents hazards of tobacco and tobacco products. Students will be present from CCISD, Bishop Garriga, Calallen ISD, Corpus Christi Montessori, Flour Bluff ISD, Homeschoolers Unlimited Texas, IWA, Rockport Homeschools, St. Pius, West OSO ISD and many more schools from the Coastal Bend area. "We are looking forward to this week's games on the ice, as well as all of the important activities taking place off the ice which will benefit the local community," said IceRays President Michael Wood. "Thousands of students will be treated to a great hockey game along with important anti-tobacco messages, and we are excited about the money that will be raised from our Heart Night specialty jerseys." The IceRays and Mudbugs each are coming off their final bye week of the season, with Thursday being the first game action for both teams in 12 days. Corpus Christi is 4-4-0-0 against the Mudbugs this season, including 3-1-0-0 on home ice. The IceRays currently trail Shreveport by seven points in the NAHL South Division standings, with Corpus Christi holding one game in hand. Single game tickets, group tickets and suites for the remainder of the 2018-19 IceRays season are on sale now. Visit goicerays.com or call 361-814-PUCK (7825) for tickets or more information. Stay connected with the IceRays on Facebook (/CorpusChristiIceRays), Twitter (@goicerays) and Instagram (CorpusChristiIceRays). IceRays games are carried live on Sportsradio Corpus Christi (1230 AM/95.1 FM/96.1 FM), HockeyTV and Mixlr with the pre-game show starting 15 minutes prior to faceoff. For more information, visit goicerays.com/broadcast.